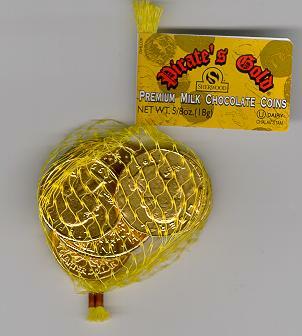 I used to love the foil wrapped chocolate gold coins when I was a child. I don’t know why I thought they were so cool, but I coveted them. I was recently sent an email from a friend warning parents not to let their children consume chocolate gold coins, because they contain melamine. Snopes.com checked it out, and the Pirate coins have been recalled in Canada. OTTAWA, October 8, 2008 – The Canadian Food Inspection Agency (CFIA) is warning the public not to consume, distribute, or sell the Sherwood Brands Pirate’s Gold Milk Chocolate Coins described below. This product is being recalled due to positive test results for melamine conducted by the CFIA. If the original product identity and UPC code is not evident, consumers are advised to check with their retailer to determine if they have the affected product. Retailers and distributors are advised to stop distributing Sherwood Brands Pirate’s Gold Milk Chocolate Coins and to initiate a voluntary recall of this product. The CFIA will be working with the importers to remove the affected product from the marketplace. Although the health risk associated with these products is considered to be low, the advisory is being issued as a result of the Government of Canada’s ongoing investigation into milk and milk-derived products sourced in/from China that may have been distributed in Canada. Melamine is a chemical compound used in a number of commercial and industrial applications. Canada does not allow its use as a food ingredient. Please note that we have not had any products containing melamine recalled in the U.S. Immediately upon the issuance of a warning by FDA about possible melamine contamination in milk-containing products from China we began to work with independent labs to confirm our products are free of melamine. Additionally, Sherwood Brands has not received any chocolate in the U.S. from China since the report on melamine. We understand that any product that may contain milk or milk proteins is being tested upon entry by the FDA…If you are concerned about the coins recalled in Canada, please note this was an isolated situation in Canada only. These coins were not sold or shipped into the US market. Those coins were produced before the melamine warning was issued. Melamine in candy is one more reason my kids won’t be eating any junk candy they get trick-or-treating, whether in Canada or the US. We have a family policy of trading the junk candy in for good organic goodies, that way my kids can still go through the childhood ritual of trick-or-treating without compromising their health. Oh yes, the good ole days. Did anyone really ever find a razor blade? Yep. this is scary stuff. However, there was a story on the national news tonight that the Chinese govt. themselves are finally getting involved because they: “are tired of having a Black Eye to the world’s consumer market”! Hey, if they want to be a a major world player…they have to make sure to NOT poison their customers (and our kids)! I’ve got some good info on pumpkin carving also. And NO the razor blades thing is an ‘urban legend’. Happy Halloween all! China is now on watch by the rest of the world to clean up their act. They need something like an FDA over there…Happy Halloween …! Maybe it is past time for Americans to boycott all products produced in China and imported to this country. hello .. today is halloween i took my child out trick or treat.. and we went to a house and a nother laddy told me.. do not let my child eat that candy that looks like coins.. she said it would hurt him or make him verry sick.. i dont under stand whay people wonts to hurt some one elce for..there are sick people out in this world anny more.. anny ways. if some one hurt my pride and joy.. all i got to say is thay will have a bad day.. i dont belive in hurtting anny one but when it comes to my child … thay will shiched thay dint see me lol.. ooooo well every one out there have a good day .. and god bless and besafe.. happy halloween..
Every country has their own problems. What about American beef and polluted waterways and such. Either these things happen or every country and everybody needs to shape up. I doubt we will even hear any stories about poisoned children from Chinese melanine. Fear is abundant, unlike knowledge. get real, you make a good point; however, I think we need to protect ourselves and children from all things our government fails, such as if you eat meat, only buying beef from local family farms that feed their cows a vegetarian diet. Hopefully we won’t hear any stories of poisoned children from melamine in North America, but we have already heard about it in China. Please let us know if you are printing the actual sovereign with different views on each side. Using the lightest possible metal. ( no chocolate involved ). They are to be sold (apart) as good luck charms accompanying various holidays’ sweets, cakes etc. The required amount we are estimating will be around 500.000 to 650.000 pieces. Will you please respond to my msg. as soon as possible?